Congratulations to bITjAM and the YMCA for their successful launch of the new bITjAM Innovation Qube (IQ) in Stoke-on-Trent. Carl and Ben (bITjAM) are seen below in front of the output screen for the Oculus Rift, the immersive 3D headset that’s shaking up the videogaming world. The Rift is available for use on the Qube’s modern two-floor site, along with lots of other fab digital kit. The Qube also offers access to creative talent and teaching/learning opportunities, in a friendly setting that is refreshing different from the usual educational environment. The Qube is located at the rear of the North Staffs YMCA activity centre in Stoke-on-Trent. See the Qube website for full details and forthcoming events. The Federation of Small Businesses (FSB) has re-launched its North Staffordshire branch. They have an “Exporting & International Trade Made Easier” evening on 1st April 2014. Jobs: bet365, one of Stoke-on-Trent’s largest employers, has vacancies for: a Social Media Editor and a Social Media Editor (night shift) within the Social Media team at the Stoke HQ (bettings/sports knowledge essential); also a Web Developer and a Mobile Web Developer. The planned full-length feature film version of the short film The Last Train to Budapest now has a new IndieGoGo crowdfunding campaign, aiming to raise £40k for development of the movie. Creative Stoke’s interview with The Last Train to Budapest writer and director Richard Pekar is here. James Ray has a new video about Totally Local Burslem, which features the many creative and arts businesses in the town of Burslem in Stoke-on-Trent. Live In The City is a new monthly 30-minute music TV show, made for the new online community TV station called North Staffs TV. The first free edition is available online now. The show features talented local acts, and the brilliant music venues in Newcastle-under-Lyme and Stoke-on-Trent. Also the winner of NME Best Midlands Small Venue Award, The Sugarmill in Stoke-on-Trent, plus The Glebe venue, and live performances from The Motives, Shae and Liam Lavell. Staffordshire University’s Drama Department, in association with Stoke’s Regent Theatre, is set to run two adult Summer School short courses in theatre, 13th-15th August 2014. Successful applicants can choose from classes in either ‘Directing for the stage’ or ‘Performing Shakespeare’. A music event within the Staffordshire Festival is seeking choirs, singing groups or soloist singers to take part in the event and showcase their musical talent to a live audience. Interested? Please email: stafforshirefestival@gmail.com or visiting the event page at Staffordshire Festival Singers. Unpaid volunteer work: The Stoke-on-Trent based curator of the open access academic search tool JURN is seeking a recent graduate, or a former industry professional. During May and June 2014 you will develop and drive a short publicity campaign to promote awareness of JURN. The aim of the campaign will be to reach scholars, researchers and activists around the world, many of whom operate outside of academia. During May 2014 you will map the key channels and niches suitable for the promotion of JURN, briefly noting the best way to reach each of these. At the end of May you will craft a small repertoire of tailored campaign communications, and plan an agreed timetable of actions. Your awareness campaign will then roll out from 5th to 12th June 2014. Interested? Please first visit and use JURN yourself: the classic dozy search of what is history carr is a fun first test, and the semantic accuracy of its results compare very well with other academic search services such as Mendeley, Summon, and Google Scholar. Then please apply via posting a short comment anywhere on the JURN blog. Job: An Editorial Assistant is wanted by the PR team at Staffordshire University (Stoke campus). Job: Clough Hall school in Kidsgrove needs an Art Teacher for the September 2014 term. They may split the job into a part-time art / and a part-time photography teacher. Stoke-on-Trent photography gallery Gallery 116 is set to start a Young Photographer’s Club. Bookmark their website and check back for more details soon. Congratulations to Meir-based Dan Weatherer, whose recent film was awarded ‘Best UK Short Film’ at the Stoke Your Fires film festival 2014. Dan wrote and co-produced The Legend of the Chained Oak. The film adds to the growing list of successful shorts, features and series based on local North Staffordshire legends and folklore. Watch for an interview with Dan in the next Factory magazine. Added to the Directory: Domesday Morris, a folk-dance morris dancing group based in Penkhull, Stoke-on-Trent. 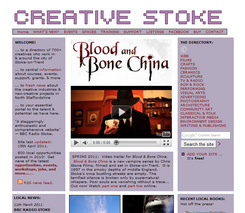 Added to the Directory: CineRobota a local Stoke-on-Trent video production company. North Staffordshire’s Trentham Gardens is running a series of one-day garden design workshops during spring and summer 2014. Work with award-winning garden designer Clive Mollart, to learn how to make the most of your garden design or apply design to… “that problem area that has always been a challenge”. A date for your diaries: the first Stoke-on-Trent Literary Festival: Hot Air is set for 20th-22nd June 2014. The full programme is due to be announced before the end of March. The Stafford Arts Festival is set for 6th September 2014, and the organisers are now seeking a wide range of artists, writers, and performers to take part. The festival takes place in various venues and locations around the town centre, both indoor and outdoor, with the main performance area being in the central Market Square. Application deadline: 14th April 2014. Destination Staffordshire has 300 free training places available on an EU-funded “destination and customer service training programme”, for those working in tourism and visitor attractions. A major new book has just been published, The Natural History of Keele University. The work is the result of many years of research work and writing by Keele’s own natural historian, Dave Emley. James Peake, a radio production student at Stoke-on-Trent college, has a range of audio interviews and podcasts on Soundcloud. Including and interview with Cath Ralph, the outgoing CEO of the Burslem School of Art. The Royal Television Society (RTS) undergraduate bursary scheme is now open for application, until 31st May 2014. The scheme offers 20 bursaries of £3,000 (£1,000 per year) to students who are studying television production and broadcast journalism at accredited British universities. In addition recipients will receive free membership of both the RTS and The Hospital Club, a creative arts venue and members’ club in the heart of London. Four West Midlands disabled visual artists are to be offered four hours of free mentoring. Sessions can cover topics such as career development, portfolio development, the artist’s statement, networks and websites, and general information. Application deadline: 24th March 2014. Paid work: The Big Dance West Midlands hub wants to appoint a West Midlands based choreographer for The Sightseers, a series of six unique outdoor performances to take place around the West Midlands during the Big Dance Weekend on 12th-13th July 2014. Inclusive fee: £4,000. Application deadline: 24th March 2014. Paid work: A casting call from a Stafford agency, for TV shows including Peaky Blinders — a major TV drama show which is now doing some limited filming in Dudley, whereas they usually film in Leeds. Job: The Midlands office of Arts Council England needs an Artistic Assessment Assistant to help co-ordinate a programme of assessments. Application deadline: 23rd March 2014. The nearby Shrewsbury Museum and Art Gallery is offering an opportunity for a disabled artist-filmmaker to undertake a commission from April 2014 onwards, to be completed by early February 2015. Application deadline: 31st March 2014. See the Web page for full details. The nearby University of Wolverhampton has new short courses in Fused Glass Jewellery Making, Silver Jewellery Making, and Concept Art for Videogames, starting in April 2014. Local science fiction, fantasy and horror writers may be interested in Edge-Lit 3, to be held at the QUAD in Derby on 19th July 2014. Edge-Lit is… “a day of science-fiction, fantasy and horror writing”, and is set to have guest author Charles Stross in attendance. Tickets are £25. Paid work: Derby Silk Mill is seeking a creative partner to co-develop, design and deliver a textured installation in the entrance of their new ground floor space. They are also seeking a creative partner to use… “hundreds of Derby Porcelain figure moulds from the museum collection” to create a ceramics based wall display in the space. Application deadlines: 3rd April 2014. What’s billed as the first set of live “World Animation Masterclasses” are to be held in the Midlands at the International Convention Centre, Birmingham, on the 23rd-25th May 2014. The organisers have lined up… “six master teachers to deliver a unique series of masterclasses containing information that is just not available in books, video or the internet”, and they are reportedly expecting around 1,500 animators to attend.